UNIT 4: WHAT A WONDERFUL WORLD! Today's focus activity is a short video about the Jazz Age also called the Roaring Twenties! Describe America’s policy about foreign affairs after World War I. Explain the causes and effects of America’s post W.W. I economic boom. Describe the changes that occurred for women and young people in the 1920’s. Explain why national Prohibition was repealed. Describe the causes and effects of the Great Migration. Explain why bigotry and prejudice was so prevalent in the 1920’s. Explain the causes of the stock market crash of 1929. Describe life during the Great Depression. Explain the criticisms of Herbert Hoover. Describe FDR’s efforts to help America during the Great Depression. Why it is important to study the history of the U.S. during the 1920s and 1930s. How the events, issues, and outcomes of the 1920s and 1930s effect us today. Lesson 45: The Post-War Economic BOOM! Improvisation is a big part of jazz. Improvisation is creating, or making up, music as you go along. Jazz musicians play from printed music and they improvise solos. Many famous musicians emerged during this time. Louis Armstrong, John Coltrane, Billie Holiday, Ella Fitzgerald, Duke Ellington, Jelly Roll Morton, and Johnny Mercer were only a few of the Jazz Greats that lived during this time. In this unit, we are going to study how Jazz Music tells the story of the 1920s and 1930s in American History! In your groups, follow the instructions below to complete today's portfolio activity. Create today's portfolio page in your portfolio. List this activity in your table of contents. As a group, see if you can find the answers to the following questions using the icons below. Answer these questions in PQA format in your portfolio. Your portfolio entry has been set up for you and is at the bottom of this webpage. I suggest you divide and conquer. Each member should take an icon, read it in full, and answer the questions below that they can find under their icon. Then share with each other what you find. 3. Where did Jazz come from? 4. What were the major "Jazz Cities" in the 1920s and 1930s? 5. When did Jazz first come out? 6. Who listened to Jazz music in the 1920s and 1930s? 7. Why did people listen to Jazz music in the 1920s and 1930s? 8. How did Jazz play a part in American history in the 1920s? 9. What types of music came together to form Jazz music? 10. How did Jazz change over time? 11. How did Jazz spread all over America and the World? 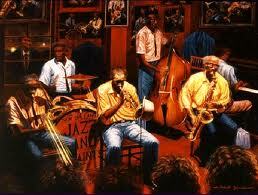 12. Who were some popular Jazz musicians and what were they famous for? 13. What are some different types of Jazz and what makes each type different? 14. How did the development of Jazz music influence people's lives today? Now, own your own, think about all that you learned about jazz music in the 1920s and 1930s today. Write a summary paragraph describing what you learned about Jazz music today. Remember how to set up a summary paragraph. You can use the Burrito Method graphic organizer on the important information wall or under the resources tab at the top of the page to help you. You can go straight to the Burrito Method Organizer Page by clicking HERE. 1. Outline your topic sentence using the “burrito” topic sentence method. 2. Make a “real” sentence. 3. Create a Fact Outline. 4. Write the summary using the Fact Outline. 5. Write a conclusion sentence that formally "ends" the summary. I found this on icon # _____________ under the _________________________ heading. _____________ under the _________________________ heading. 5. Jazz first came out __________________________________________________________. _______________________. ___________________ was famous for __________________. # ____________ under the ________________________ heading. characteristic of _________________ Jazz is _______________________________. I found this on icon # ____________ under the ________________________ heading.